For a small island, Eigg is a place that continually reveals new treasures. The more I wandered the island, the more of these places I found. Though the island is famous — and justifiably so — for its seascapes, I found countless undiscovered and tucked – away spots that stunned me with their beauty. I could understand why Bruce Percy chose the Isle of Eigg for his photography workshops; the natural splendor of the island combined with its mercurial weather was the stuff of a photographer’s dream. September 2017, focus stacking from 2 images, additional exposures for highlights, focal length 16mm, aperture f/11, shutter speed 6 seconds, ISO 64, tripod. Beyond Eigg’s misty coastlines, I found myself most drawn to the island’s caves. The island’s caves feel like secret, mystical places — the kind of places where legends are born. They feel ancient, as if, upon entering the caves, I stepped out of the present age and into a time far beyond memory. You can sense the stories they contain. One of the island’s caves — the Cave of Frances — spawned one of Eigg’s most violent tales. A long-ago feud between rival clans ended when one of the families trapped the other inside the cave. They lit thatch at the cave’s entrance then dampened the flames so that the tiny cave filled with smoke. According to the often-told story, hundreds of people were trapped and died inside the cave. Human remains have been discovered there in recent years, suggesting that even if the story isn’t altogether accurate, something ominous happened inside the cave. But I wasn’t interested in bloody feuds. I found another cave, this one so small that I had to wedge myself inside, my shoulders pressed against the stone walls. It wasn’t an ideal location for a photographer; it was barely big enough for my camera and tripod. But the cave was unexpectedly lovely. A small waterfall, fed by some unknown source, coursed down the cave’s dark, innermost wall. 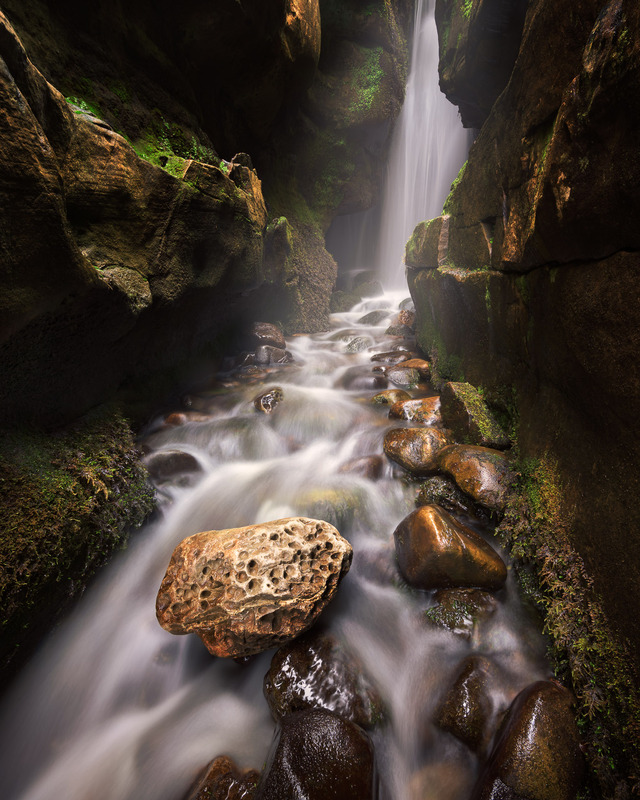 Its waters formed a stream that ran gently over ancient moss and rocks, leading to the cave’s narrow entrance. I wasn’t prepared for the wet environment, and my shoes soon filled with water, but the scene was so lovely that I didn’t mind. The shot that I got inside the cave was one of my favorites from Eigg. It captures the mystical character of the island that I came to love.